At least 30 people were killed when a fire engulfed a hospital Friday in the eastern Indian city of Kolkata, with many victims believed to be patients who died of smoke inhalation, officials said. 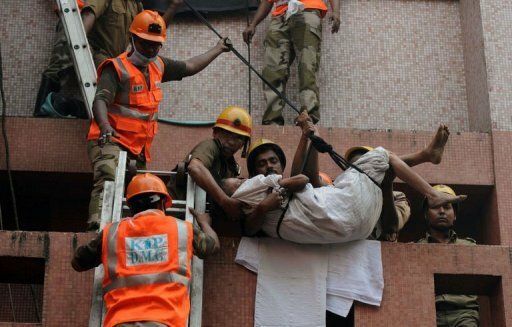 Rescue workers evacuate people after a fire engulfed Amri hospital in the eastern Indian city of Kolkata on December 9, 2011. "I can confirm that at least 30 people have lost their lives in the incident," Deputy Police Commissioner B. Dasgupta told AFP, adding that 60 people had been rescued. Most of the victims were patients, trapped by the smoke and flames that spread rapidly through the private hospital building during the night. Some local television channels put the death toll at more than 40, citing emergency rescue sources. "We have shifted 50 patients to an adjacent hospital. The situation is grim at the moment," said fire brigade director Gopal Bhattacharya. The fire broke out around 3:00am (2130 GMT Thursday) and initial investigations suggested that it started in the basement of the five-storey AMRI hospital. By 9:00am, the fire had largely been brought under control, but smoke continued to billow from shattered windows, as firemen struggled to reach patients and hospital staff still trapped in the building. "My mother is in the intensive care unit. She's 70 years old. I don't know if she is alive or not," Khokon Chakravathi told AFP. Badal Sikari, a local resident who had helped the first emergency teams to arrive at the scene, said he had seen "several bodies" of people who appeared to have suffocated. Fire engines had trouble reaching the hospital, which is surrounded by a network of narrow, winding roads.Rescued patients and those who managed to escape said they woke up to find their wards full of acrid smoke. "I was terrified, I kept shouting for help," said Jyoti Chaudhary who was admitted to the hospital a week before. "Finally, a nurse dragged me out of the ward and got me down to the ground floor," said Chaudhary, who then taken to the adjacent hospital wing. Ananya Das, 34, bearing stitches on her stomach from a minor surgery carried out the day before, said she was in post-operative recovery when the fire broke out. "I managed to walk towards and exit and then climb out of a window. I saw a lot of bodies," she said. West Bengal Chief Minister Mamata Banerjee visited the site and tried to comfort relatives angered by what they said was the slow response of the emergency services to the early morning fire. Banerjee promised a full investigation and said action would be taken if fire prevention standards at the hospital were found to have been below standard.